The Sirui SR-3203 SR Series Professional Tripod is a 3-section support with carbon fiber legs. Each section has a twist lock that turns halfway, which unlock and enable the legs to extend and reach a maximum height of 59". 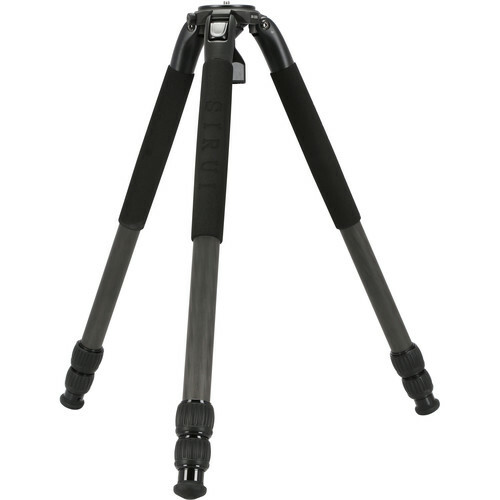 With three variable leg angles and independent leg spread, the legs can completely splay out, and the tripod can have a minimum height of 5.5", which is ideal for macro or low-angle photography. Where all the legs meet, the spider has an integrated bubble level to level out your horizon. Also, the spider has a removable top plate with a 3/8"-16 mounting stud; when the top plate is removed, it reveals a 75mm video bowl, which can accept a video fluid head of the same size, and support cameras up to 55 lb. A 1/4"-20 accessory socket is located on the side of the spider, so an arm can attach to support a video light or microphone. Box Dimensions (LxWxH) 35.0 x 7.0 x 7.0"